One of my favourite things about the holiday season is holiday parties. I just love catching up with old friends and spending time with family. Start with a Colour Theme and incorporate it into everything from invitations to decorations. Good Lighting is a Must, use dimmers or candles. Febreze Candles add ambiance, and also make great stocking stuffers or parting gifts for your guests. Let Guests Help Themselves by setting up food stations including extra cutlery and napkins. It's less intimidating than a sit down dinner, and you can set up before guests arrive. Always Be Ready for Guests by keeping a Swiffer WetJet with Swiffer WetJet Extra Power Pad with the scrubbing power of Mr. Clean Magic Eraser in the hall closet. You can quickly clean ensuring your home is free of unwanted dust and footprints. Hide the Mess by pre-loading the dishwasher with Cascade All-in-One ActionPacs, and load dishes as you use them. If you are washing dishes by hand, Dawn Original gives you an overnight soak in five minutes, allowing more time for visiting with your guests. Open to Canadian Residents (excluding Quebec) who are the age of majority only. Valid entries only. Contest ends Thursday, December 20, 2012. For further contest rules, refer to the Terms and Conditions within the Rafflecopter. i love the magic eraser! I like the swiffer!! Gets rid of DUST nicely! Mr Clean Magic Erasers are my go-to P&G product. They do amazing things! I love the Magic erasers. I love the Mr. Clean magic erasers. They work wonders! My favourite P&G cleaning product is Mr. Clean Magic Eraser. I think my swiffer wet jet is very convenient, and probably the item i use most. Magic Erasers :) They've saved my bacon more then once. Easily the Magic Erasers or the Febreeze air freshner. With kids and dogs, they're a MUST. Easily Magic Erasers and Febreeze. With 2 kids and 2 dogs, they're a MUST. I like my swiffer. So easy to use. I like the Swifter Dusters. My favourite is Mr. Clean. I love the Mr. Clean magic eraser. It's great for cleaning windows. I really like the Mr. Clean Magi erasers. I love Febreeze - currently my favourite is a citrus one. I Love the Swiffer Sweeper!!! It is the only thing I have to use on the floors of my home! 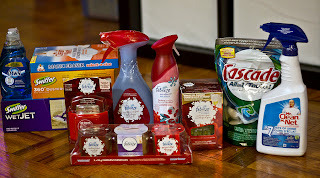 Febreze all the way...any fragrance, any product!!! Swifter Dusters are the best. Cascades I think, this guy cleans without my participation.